When Nordhoff High School first opened in 1909, classes were held upstairs in the old two-story grammar school, located where the OUSD offices are today. The driving force behind the school was Sherman Day Thacher, founder of Ojai’s Thacher School. Mr. Thacher was also responsible for hiring the high school’s first principal, Walter Bristol. In 1909 Nordhoff High School had twenty-four students and two faculty members, including Mr. Bristol. In the school’s second year, Mr. Bristol and the trustees initiated plans to create a new campus for the high school facing Ojai Avenue at Country Club Drive. They selected Los Angeles architect Norman Foote Marsh to design the school in the California Bungalow style, popular in the Ojai Valley in the early 1900s. The Boyd Club, Thacher School, the Pierpont Cottages, and several expensive homes along Foothill Road were all done in the California Bungalow style. This style is easily recognized with its sloping roofs, gables, exposed rafters, expansive porches, shingled siding, and integration with the earth using river rock or planting. Nordhoff High School would be one of the first public high schools built in the California Bungalow style. Norman Marsh’s Parkhurst Building in Santa Monica. Norman Marsh was a well-known Southern California architect who was proficient in several architectural styles. 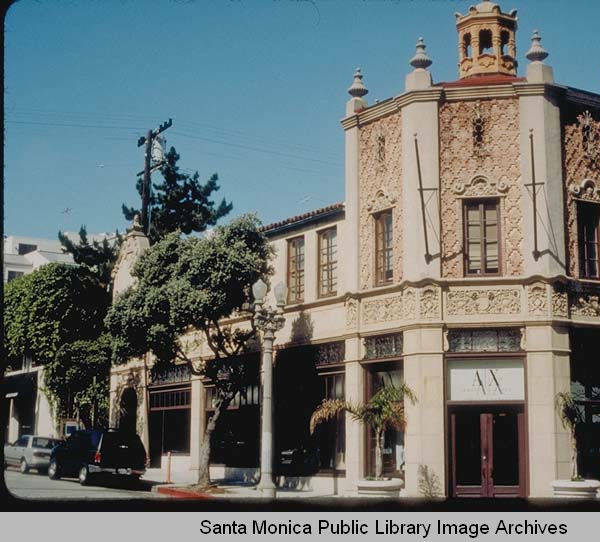 He designed Santa Monicaâ€™s Parkhurst Building in Spanish-Colonial style, the University of Redlands in neo-Classical style, and Abbot Kinney’s Venice Beach development as a replica of the famous Italian Renaissance city. Marsh’s firm designed many schools, libraries, and churches, throughout Southern California. Mr. Marsh designed the new Nordhoff High School so that, in his words, “every window will extend to the floor and will swing open their entire length. The pupils will in ordinary weather practically work out of doors.” This was a revolutionary concept in school architecture at the time, but it has since been used extensively in schools throughout America. 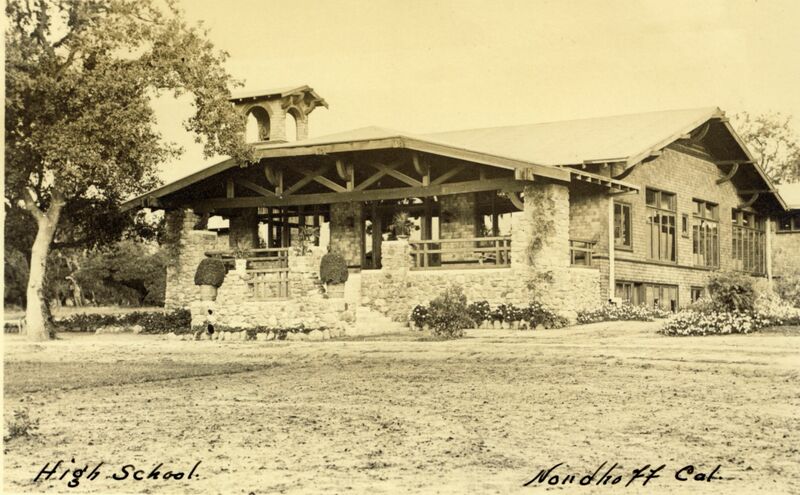 The new Nordhoff High School campus opened in the fall of 1911 with 40 students. In 1916 wealthy oil tycoon Charles Pratt, who owned a large Greene & Greene Bungalow home on Foothill Road, donated the funds to add a manual arts building and a domestic science building to the campus. Walter Bristol hired Norman Marsh to design these buildings also. The great Ojai fire of 1917 destroyed one of them, but Mr. Pratt donated the funds to have it quickly rebuilt. In 1917, the name of the town was changed from Nordhoff to Ojai. Over the years there have been several attempts to change the name of the school from Nordhoff High School to Ojai High School, but all have failed. Perhaps the traditional name is too deeply ingrained, or perhaps the phrase “Ojai High” is just a bit too quirky! In 1929 Santa Paula architect Roy Wilson designed the school’s Mission-Revival buildings along El Paseo Road, with the school auditorium added in 1936. Yet, the aging Bungalow-style building pictured at the top of the page continued to be used as classrooms until 1966 when the high school and junior high school swapped campuses. At that time it was torn down and replaced by the nondescript classroom buildings that face Ojai Avenue today. Maybe the text could be corrected. Loved looking at the old pictures. To avoid confusion, I removed the picture of Roy Wilson’s Mission-Revival buildings. I will create a separate post covering these beautiful buildings, which were added to the campus in 1929. Yes, they still form the heart of Matilija Junior High School along El Paseo Road. Wilson designed other OUSD buildings, too, including the present District Offices and San Antonio School.